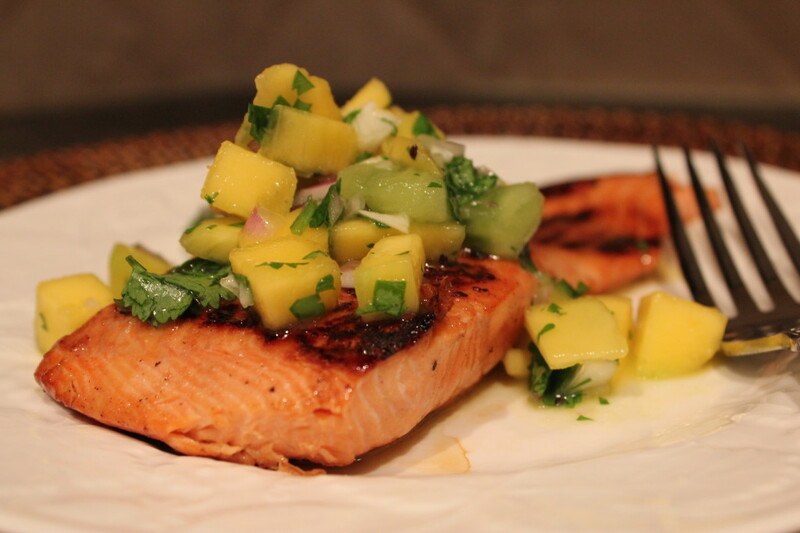 Springtime has definitely arrived here in Dallas and with the warmer weather, I don’t know about you, but I’ve been craving light, healthy dishes like this salmon recipe. 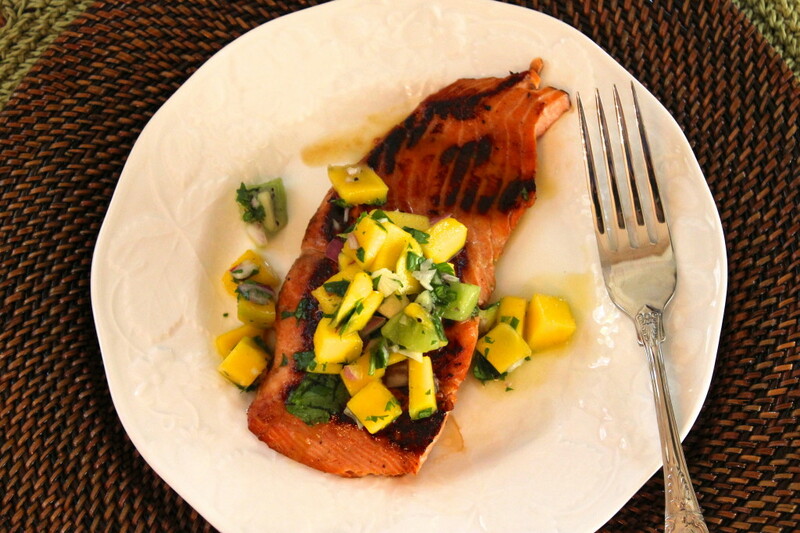 I found this marinated salmon with mango-kiwi relish recipe from Cooking Light, and boy is it good! I loved the sweet-salty marinade and unique fruit filled sauce, which made this recipe really stand out. In addition, it was quick, easy, and perfect. Including prep time, in 15-20 minutes you can have a meal on your table and ready to eat. No need to worry about calories with this one, with only 321 calories and 36.8g protein, you’ll be fully satisfied and on your way to losing weight! Plus, you’ll get a healthy dose of omega-3 fatty acids from the salmon. So here’s to my newest springtime favorite… enjoy and serve over mixed greens, steamed couscous, on toasted sourdough bread for a fish sandwich, or as you please. 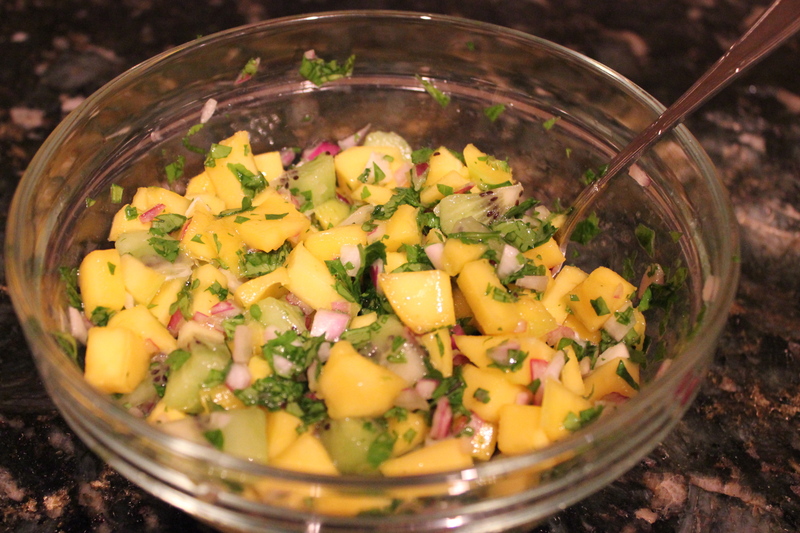 Chop mango, kiwi, red onion, and cilantro. Toss with 1/4 cup orange juice. Heat the grill or (in my case) a large skillet with nonstick cooking spray. Add salmon and cook for 5 minutes on each side, or until fish flakes easily when tested with a fork. Top salmon with relish and serve immediately. TO PREPARE SALMON, combine first 4 ingredients in a large zip-top plastic bag. Add fish to bag; seal. Marinate 10 minutes, turning occasionally. 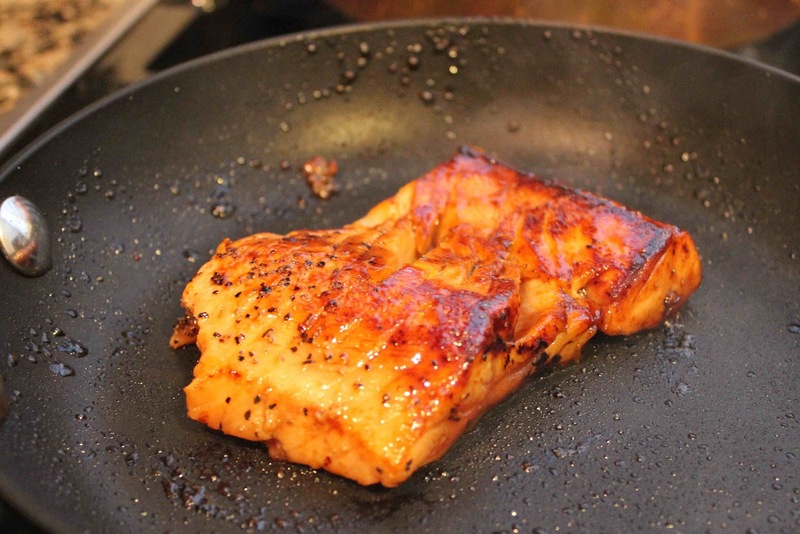 While fish marinates, heat grill pan or large nonstick skillet over medium-high heat. Remove fish from bag, discarding marinade. Coat pan with cooking spray. Add fish, and cook for 5 minutes on each side, or until fish flakes easily when tested with a fork. WHILE FISH COOKS, PREPARE THE RELISH. Combine mango and the remaining ingredients. Serve over fish. 2 Responses to "Marinated Salmon with Mango-Kiwi Relish"
you are a great author. I will make certain to bookmark your blog and will come back from now on.